was at the Pavilion theatre Glasgow on Sunday 24th Oct 2004.
who collapsed and died 3rd Nov.2002 aged 71 whilst on a UK tour. Born Anthony James Donegan in Glasgow's east-end, Mill Street, Bridgeton on April 29, 1931, ( his parents were married in March 1930 in Bridgeton ) he bought a guitar at 14 and set about forming a band. After a spell in the army, he put together the Tony Donegan Jazz Band and began playing in clubs around London. An early highlight came when he was asked to appear at the Royal Festival Hall as the opening act for one of his boyhood idols, the bluesman Lonnie Johnson from whom he had taken his first name. Queen guitarist Brian May said "Lonnie was a hero of mine. The first record I ever bought was Rock Island Line. I was about 10. People remember My old man's a dustman, Chewing gum etc, but there was a more serious side to Lonnie. He was the first guy to bring the blues to Britain. The skiffle movement helped a generation realise they could make music themselves. I think he is probably the principal reason I picked up a guitar." And 1980's star Jim Diamond, also from Bridgeton described Lonnie as a musical pioneer. He said "As a kid I thought Lonnie's songs were just great comic pieces but, as I got older, I realised he was actually breaking new ground musically. He was a great son of Bridgeton and will be sorely missed. 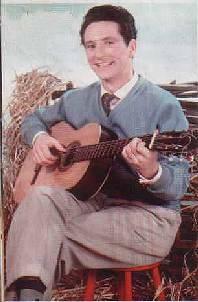 Paul McCartney once said "When we were kids in Liverpool the man who started the craze for guitars was Lonnie Donegan. We studied his records avidly and all bought guitars to be in a skiffle group. Yes the best of them — including the Beatles and the Rolling Stones —always acknowledged the critical part he played in their own musical educations, and he remained an enduring icon to many superstars. Elton John, Paul McCartney, Ringo Starr, Ron Wood of the Stones and Brian May of Queen were among those who joined him in 1978 to rerecord many of his old hits on an album, Putting on the Style, produced by Adam Faith. To illustrate the power of the man, shortly before his death, he received a telephone call from Eric Clapton, who was arranging a tribute concert to George Harrison (to be held on 29th November at the Royal Albert Hall). In recognition of Lonnie's early influence on the young George, when the Liverpool lad played Skiffle, Eric wanted Lonnie to open the show. A few days later, Eric rang Lonnie again. Now he wanted Lonnie to close the first half of the show. Why? Because he couldn't find anybody who wanted to follow Lonnie - they all knew that this man, of seventy plus years, would blow them away. Lonnie is gone but we have his music. For fifty odd years he has entertained us, from being a humble banjo player in a jazz band to 'pop' giant. In fifty years time, someone, somewhere, will still be playing his music. A true star is always a star. Lonnie burst onto the music scene in the mid 1950s and his first hit, Rock Island Line, achieved the then rare distinction of soaring up the US hit parade to No.1 in 1956. From then until the Beatles era he was rarely out of the charts and indeed he had 27 UK top 20 hits in one six year period alone. He changed his name as a tribute to black American guitarist Lonnie Johnson. His family moved to England when he was a child, he left school at 14 and then joined the army at 18. There he met an American who introduced him to Country & Western music. Lonnie had good looks which attracted screaming girls-his songs were raucous for the time. In 2000 he was awarded the MBE. He lived life to the full, marrying third wife Sharon - a former teenage fan - at 48, and became a father for the seventh time in 1990 at the ripe old age of 59.
" 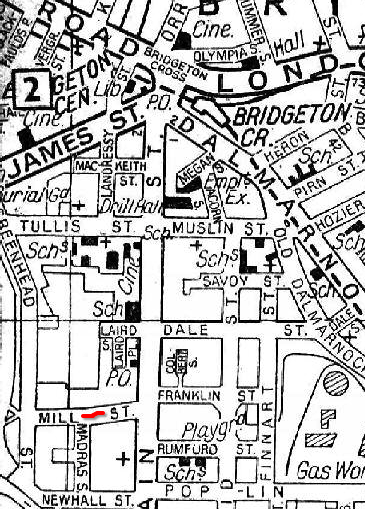 The recent death of one of my childhood heroes Lonnie Donegan made me think of the many excellent skiffle events held in the fifties around the Bernard Street neighbourhood. The band would usually consist of a group of 16/17 year olds playing a guitar, a bass made out of a tea-chest and a brush handle, a wash board, mouth organ and sometimes spoons. As they sang everything from Rock Island Line to Long lost John and Stewball, there would be up to one hundred people of all ages listening or singing and dancing along. I remember pushing into a space with a good view on the washoose dyke while others watched from their backcoort windae all with gleeful faces and singing away. This was around 1953 a definite period of austerity so the music raised us above the severity of the slum conditions in which we lived, and for this we must give thanks to the Glaswegian born Lonnie. 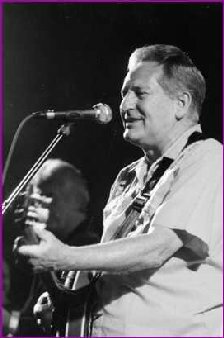 "If anybody asks you who sung the song, tell them Lonnie Donegan been here and gone". (A line from Long Lost John)"
August 22nd.1979 and that's ma' "DRY DATE" the day ah hud ma'last drink. Ah' no it's mebbe no posh tae talk aboot A.A. as some people urr ashamed of a connection, bit no me!You sure as hell knew a' wis a drunk an' ah'm awfy sure you'll be able tae tell if ah'm sober. Funny thing is' ma' Mammy wis always ashamed of it an' asked me "no tae tell anybody ah went tae 'the A.A. things' ah' wunder if the attitude has chinged ony??? When ah'wis walkin' alang Argyle St. wi' ma' wee brother in 1988 we came oan a 'couple o' rough lookin' jokers, needin' 'a wee drink' ma' brother said "Ignore them" bit! huvvin been there masell ah' fished oot a fiver an' started singin' Lonnie Donnegin's song "Have a drink, have a drink, have a drink on me" and there we wurr' three kindred spirits, dancin' in the street an' ma' heart wis lifted an' still is, when ah' think back oan it. Ye' see! ah' remember masell, trying tae stay sober nae money nae freins, nae hoose an' aw' ah' hud tae dae wis start singin' oan Yonge St. here in Toronto an' ah' made enough fur a packet o' fags, a hamburger and fries an' mebbe, a $1.99 breakfast the next day. Oh' my God! how! in the name o' the wee man, did I get stertet oan that??? WEBMASTER :- Great story mister...if we were being honest .... maist o' us would and do walk by these guys. Ah could picture ye's awe burlin roon the pavement in Argyle Street and ah burst oot laughin' when a read it!